BRITS – The family of a 28-year-old man in Mothotlung in the Brits area have confirmed their relative died after service delivery protests in the area. Lerato Seema is believed to be the third victim of clashes with police over water shortages. 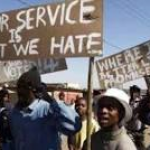 Colonel Sabata Mokgwabone said the man and his friend were arrested on Tuesday for public violence in the area during a protest about water shortages. “The men were put in the Nyala that was headed to the police station; one man managed to escape and the other one tried to escape, but fell from a moving Nyala,” said Mokgwabone. He said the situation in the area remained calm and police were patrolling. On Monday, two people were killed allegedly by the police, during the protest. Their innocent request [for water] was met with brutal murder. This is what this current government has become known for.